NMRV – Sizes: 025-030-040-050-130-150. NMRVpower – Sizes: 063-075-090-110. 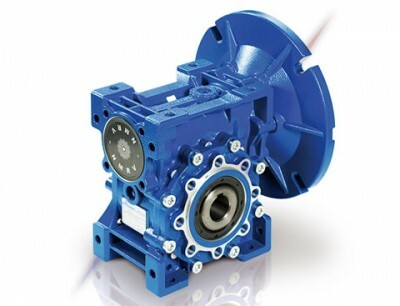 Available versions: fitted for motor coupling, with input shaft, with torque limiter. Power up to 15 kW. Max torque 1.550 Nm and admissible radial loads max 16.500 N. Cases up to 110 in die-cast aluminium alloy and over 130 in G200 grey cast iron. Aluminuium units are supplied complete with synthetic oil which allows universal position mounting, with no need to modify lubricant quantity. Moreover units without plugs reduce the risk of oil oxidation and contamination. Worm wheel: bronze Cu Sn12 Ni2 (UNI7013-10). Ground worm profile ZI (UNI4760). Loading capacity in accordance with: ISO.14521, DIN.3996, BS 721, AGMA 6034, ISO 6336, DIN 3990, DIN 743, ISO 281. Size 030 and over are painted with RAL 5010 blue epoxy-polyester powder in according to DIN 1843. PC, pre-stage reduction units available for motor power up to 2,2kW and size up to 090. NMRV-HW – with helical unit. NMRV-HW – reduction ratios between 22,8 e 1.083, max torque 1.100 Nm. Worm gear reducers are available with diffferent combinations: NMRV+NMRV, NMRVpower+NMRV, NRV+NMRV, NRVpower+NMRV, PC+NMRV, HW/NMRVpower, IHW/NMRVpower. Options: torque arm, output flange, output shaft kit, cover, double extention high speed shaft.